*Note – We’ve posted, verbatim, the information from the EPA on Camp Pendleton on this page rather than simply sharing a link. This is to maintain an ongoing record of the information to-date as of October 2015, in the event it is edited or removed from their site in the future. You can view the link to the EPA page at the bottom of this post. 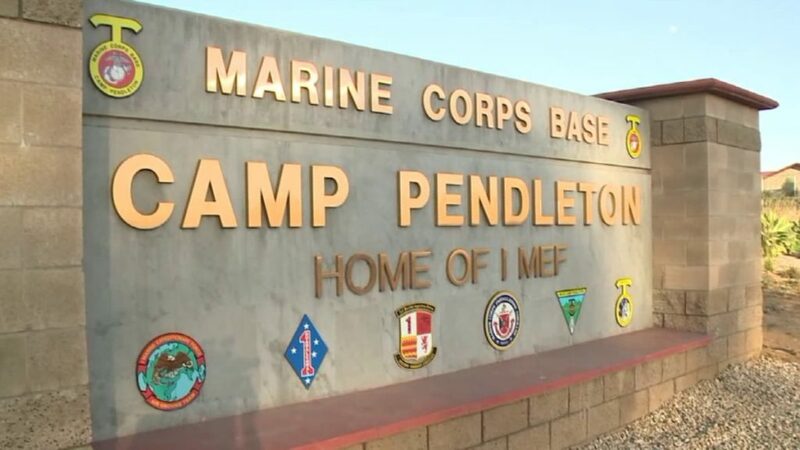 The Camp Pendleton Marine Corps Base site covers 125,000 acres in San Diego County, California. The base provides housing, training, logistical and administrative support for the Fleet Marine Force units. Past disposal practices have contaminated the groundwater and soil. In an initial investigation, the Marine Corps found nine areas of contamination. Waste generation operations at this site include maintenance and repair of vehicles (trucks, tanks, and aircraft); landfill operations; waste disposal areas, such as scrap yards; and fire fighting drill areas. The base contains wetlands, streams, and rivers which feed into the Pacific Ocean. This land is the only remaining undeveloped area between Los Angeles and San Diego. Groundwater and soils are contaminated with volatile organic compounds (VOCs), spent oils, fuels, polychlorinated biphenyls (PCBs), pesticides, metals and herbicides. Though groundwater provides drinking water to the entire installation, the current drinking water supply is within drinking water standards. The site is being addressed in four long-term remedial phases focusing on cleanup of soils; landfills, surface impoundments, and groundwater; other soils and groundwater; and remaining areas. Group A (OU#1): In 1990, the Marine Corps began an investigation to determine the nature and extent of contamination of the soil and groundwater at six subsites where data were already available. The investigations were completed in the fall of 1993, and final cleanup measures started in mid 1996. The OU#1 Record of Decision (ROD) was signed in 1995 and included institutional controls and monitoring for Site 9. The remaining sites called for no further action. Group B (OU#2): Landfills, Surface Impoundments, and Groundwater: In 1990, the Marine Corps began an investigation of the nature and extent of contamination in the landfills, surface impoundments, and groundwater. The OU#2 ROD was completed in 1997. The surface impoundments were included as no further action sites. The groundwater sites were deferred to OU#4 and the Site 7 landfill was included as part of OU#3. The landfill is capped as part the OU#3 remedial action. Group C (OU#3): Other Soils and Groundwater: In 1990, the Marine Corps began an investigation into the nature and extent of contamination of soils and groundwater on the base located in the Santa Margarita watershed, where data was not yet available. The investigation was completed in 1996, and the ROD was signed on February 11, 1999. The remedy selected was excavation and disposal at an on-base landfill that was designated as a Corrective Action Management Unit (CAMU). The remedial action was completed in 2002. A methane capture system for the site is currently being constructed. The site has also been chosen as the location for a solar panel array to generate energy for several on-base projects, including powering the methane recovery system. An Explanation of Significant Differences was completed in 2008 to cover the work . OU#4: Remaining Areas: An investigation of the nature and extent of soil and groundwater contamination in subsites outside the Santa Margarita watershed on the base has been completed. The ROD was signed in June 2007. Soils removal has begun and several sites have been cleaned. Remedial Action Completion Reports were completed in 2010. OU#5: The OU-5 ROD contains Sites 1D, 1A1, 21, 1111, 6A & 13 . The OU is comprised of sites which required a greater level of cleanup funding than previously proposed or were uncompleted when Site 7 was pre-maturely closed. The ROD was signed in 2007 and soils removal has begun. Site 1-D has encountered unexpected groundwater not contemplated in the ROD and a ROD amendment is being prepared by the Navy. Soils remediation at the site will be ongoing. Camp Pendleton is participating in the Installation Restoration Program, a specially funded program established by the Department of Defense (DOD) in 1978 to identify, investigate, and control the migration of hazardous contaminants at military and other DOD facilities. It is not a closing base, but a growing base. At the same time, the Marine Corps is maintaining biodiversity at the site. In December 1995, 14,000 cubic yards of soil containing trichloroethane (TCE) and Total Petroleum Hydrocarbons (TPH) was removed from a former fire-fighting drill field. The TPH contaminated soil was treated through bioremediation and the TCE contaminated soil was removed and disposed of at an off-site landfill. In January 1997, approximately 12,000 cubic yards of soil containing organochlorine pesticides (maximum of 140 ppm DDT and 1280 ppm DDD) was removed from a former pesticide disposal area–Site 3. The soil was stabilized at an on-site treatment facility and disposed of at an on-site landfill. Thirty-two 55 gallon drums of material containing pesticide and medical waste were also removed and disposed of off-site. In January 1997, approximately 25,000 cubic yards of soil containing pesticides, metals, and PAHs was removed from Site 6 and stabilized at an on-site treatment facility and disposed of at an on-site landfill. In February 2007, Site 1111 was excavated to remove drums containing pesticides and solvents. Groundwater was removed from the excavation, treated on site and removed form the facility. The excavation was continued until all soils were clean. Four new monitoring wells were installed and will be monitored to assess if further groundwater remediation is necessary. In 2002, the Marine Corps completed construction of a landfill cap for a 28 acre class III landfill which operated from 1946 to 1970. The Marine Corps followed EPA’s presumptive remedy guidelines for landfill caps with oversight from EPA under the Federal Facility Agreement (FFA). Construction began in April 1997. The landfill was designated as a CAMU as part of the OU#3 ROD. Remedies that have not yet been completed, but are still in the construction phase for IR Sites: 12 Area Site 13, 33, 1115 and 22/23 Area groundwater(OU-5); and 1114, are expected to be protective upon completion and in the interim, exposure pathways that could result in unacceptable risks are being managed. The remedy for IR Site 7 was found to be protective of both human health and the environment. The methane levels in compliance gas monitoring probe GP-9 have been addressed by the installation of a landfill gas mitigation program.